The invasive European green crab population has exploded in Maquoit Bay over the last few years due to warming water temperatures. It's believed they are responsible for the eel grass decline as they pull it up in the search of food. ELLSWORTH, Maine — Green crabs are starting to make some coastal Maine residents see red. The crabs have been found in coastal waters off Maine for around a hundred years, but it’s only in the past few that they’ve drawn the ire and attention of fishermen and scientists in the state. Officials have been receiving reports from fishermen that the coastal population of the crabs, which migrated to North America from Europe with shipping traffic in the late 1800s, has shot up, according to Kohl Kanwit of the Maine Department of Marine Resources — and eelgrass beds and soft-shell crabs have been paying the price. That’s why, in late August, DMR organized a one-day, coast-wide survey to try to get a handle on exactly how many green crabs might be skittering around the shallow waters off Maine’s beaches and marshlands. Kanwit said only preliminary results from the survey are available, but even when all the information is in, it will be hard to put into context. The department has not done a green crab survey for at least 20 years, and the survey methods used back then may not be the same as those used in August, when lobster traps and some specifically designed for green crabs were used. 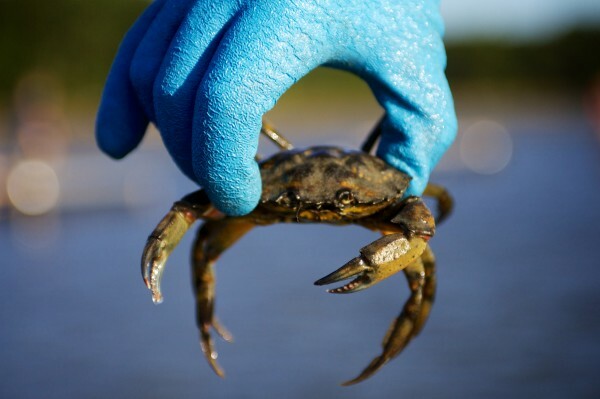 But she said that anecdotally, there is consensus among fishermen and marine researchers that “green crabs have increased appreciably in the last two years” between Biddeford and Frenchman Bay. “One of the objectives of the study was increasing awareness of the issue of green crabs coast-wide, and that was achieved,” Kanwit said in an email. Preliminary results from the survey indicate that 94 percent of the 221 traps deployed between Biddeford and Lubec on Aug. 28 had at least one crab in them. Seventy-five percent had at least 20 crabs. One trap caught 575 green crabs while the highest catch rate was in Searsport, which had an average of 191 crabs per trap. Kanwit said DMR hopes to release the complete data from the survey at a Dec. 16 conference at University of Maine in Orono. The conference is free and open to the public but preregistration is required. According to Darcie Couture, a former staffer at DMR who now works as a consultant, the increase in the green crab population has been bad for soft-shell clam harvesters. She said there has been keen interest in the issue in the Freeport and Brunswick areas, which yielded some of the highest catches from the August survey and where eelgrass beds have been depleted. Couture said increased water temperature in the Gulf of Maine in 2012 could be another factor. Part of the concern about their growing numbers is economic. Maine’s soft-shell clam harvesters have done relatively well in the past dozen years, cumulatively earning between $11.6 million and $16.6 million for the statewide harvest each year since 2001. In 2012, soft-shell clam diggers were paid a total of $15.64 million for their efforts, according to data compiled by DMR. Since 1950, the highest-earnings year for the industry was in 2004, when it made $16,627,775 in gross revenues. There is also the environmental concern. Dr. Jane Disney of Mount Desert Island Biological Laboratory in Bar Harbor, who has been leading local efforts to restore eelgrass beds in Frenchman Bay, said that eelgrass is known for serving a nursery habitat for many marine species and for helping to stabilize sediment and improve water quality, among other things. “At this point, we’re down thousands of acres [of eelgrass] in Frenchman Bay,” said Disney. But she was quick to add that though the prevalence of green crabs appears to be a factor in eelgrass health, it may not be the only factor. Disney said there are some places where eelgrass and green crabs seem to coexist, which suggests that there may be other variables that determine whether eelgrass beds can sustain themselves. “There are so many [green] crabs, it’s really unsettling,” Disney said. Maquoit Bay, off Brunswick and Freeport, has been another place where the population of crabs has taken off at the same time that eelgrass beds have declined, scientists have said. Couture, the consultant working with Freeport to assess the impact of green crabs on local soft-shell clam populations, said that, by next spring, she and others hope that heightened awareness of the issue will lead to more research and more proactive measures to keep the crab population in check. “The research is kind of gearing up now,” Couture said.